This program creates a solid understanding in cycling training and class format. This all inclusive training includes cycle set up, posture and cycling technique, class drills, safety, incorporating the M3 computer, class design, class set up and instructing techniques. This course is recognized by AFAA, ACE and the AFLCA for continuing education credits. Have you incorporated time trialing, pace lines or drafting into your indoor cycling classes? This workshop is loaded with cycle training techniques that are taken straight off the road. With a stronger understanding and how-to application of cycling elements such as drafting, pedal stroke and more, this workshop will connect your cycling experience to the world of outdoor riding. 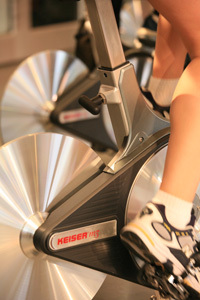 Ramp up your participant’s competitive edge by taking their indoor cycling experience to a whole new level. Empower your self, your students and your class with instructing and communication skills that will take your students beyond a basic indoor cycling class. Knowing what to say and how to say it, plus managing key class components such as format, flow and focus will propel your cycling workout from okay to fabulous. Learn how to be the best instructor you can possibly be; and more importantly, inspire your students to ride away feeling empowered. Put away the bike pump, but get out your instructing tool box! Proper bike set up is only half of the equation when it comes to an efficient ride. Learn how the effective use of cycling set up, technique, form, and muscle activation can ensure your participants take full advantage of their endurance, power, efficiency and safety. Evaluate bike set up to maximize results and experience practical drills to teach your participants to ride with muscles that power the pedal stroke and relax those that contribute to fatigue and pain. Equipment needs: Indoor cycling bicycles. Our participants spend the majority of their day sitting, driving and THEN come to our cycling classes. This bent over posture can effect the length and tension of the hip flexors, pelvis and thoracic spine musculature. Experience range of motion, planes of motion and stability moves to incorporate throughout the class ensuring you are moving your students to restoring their alignment. 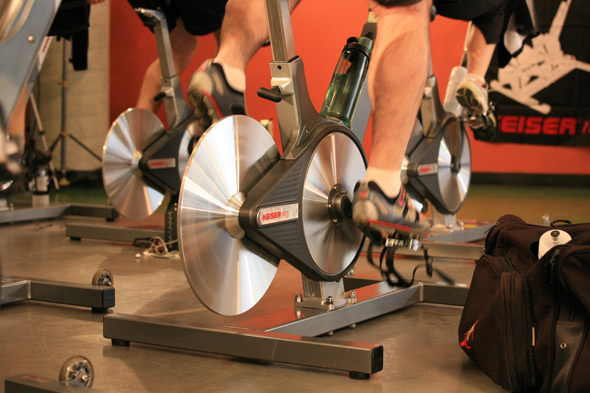 One of the challenges that many instructors face is trying to come up with interesting indoor cycling classes. Although biking postures are fairly standard, an instructor is not restricted to the number of ways a workout can be made creative, interesting and effective. Ride away from this workshop with ideas for different styles of classes plus add a creative spin to some of your favorite drills. Are you ready for the big mountain stages? Take your cycling class to new heights as you challenge our participants with this hill training workshop. Build power, strength and experience what the body can really endure. Learn creative motivational techniques to empower your students to climb further and longer than they ever thought they could. Power measurements are an extremely valuable training tool. The amount of work completed in a given amount of time by a cyclist is known as power, and is measured in watts. In this workshop, you will experience and learn how to effectively control force and velocity to increase watts. On bike time will provide samples of power tests you can do with your students to measure, track, improve and repeat. Working within an individuals’ power zone not only enhances the rider’s experience, but personalizes the workout. In this session, we will review various methods to test power and apply the information to a variety of workouts and class formats. By testing, tracking and re-testing power, indoor cycling workouts become revved up and results-driven. Training with power can truly enhance your students’ cycling experience. Power not only makes a cyclist’s journey more interesting, it maximizes their riding potential. This workshop will teach you the key components of power training and how to develop power zone profiles and power based classes. Haphazard training without objectives can often dilute the effects a ride and bring substandard outcomes. Feel confident utilizing the watt reading on your computer to maximize results. Give your intervals some substance by incorporating power goals. Ensure your participants identify a realistic challenge that is unique for them on any given day and learn how to incorporate their goals into each step of the class. This workshop is loaded with power packed interval drills that will keep your participants puffing for more. From daring switchbacks and rolling hills to racing lasts and risky downhills. All-Terrain Access will take you on a ride journey beyond the basics. From a deeper understanding of how each terrain requires a different ride focus and how technique and strategy play a big role, this fun and exhilarating indoor ride will leave you with a toolbox of actual ride profiles with corresponding drills and music. Your next class will be a breeze with All-Terrain Access. Stop taking your class on a road to nowhere! This workshop will take you through a grab bag of theme ideas and focuses that have proven successful in the indoor cycling setting along with the tips, tricks and tools to pull them off. Learn how to develop and deliver rides that will get the entire facility buzzing about the experience, the challenge and what is coming next.